The top defense officials of South Korea and the United States have agreed to further build the countries' joint deterrence against North Korea as part of efforts to denuclearize the communist state, Seoul's defense ministry said Saturday. The agreement came in South Korea-U.S. defense ministers' talks held between South Korean Defense Minister Song Young-moo and U.S.
Defense Secretary Jim Mattis in Hawaii on Friday (U.S. time). "Stressing that any attempt to create a gap in the South Korea-U.S. alliance will fail, the two ministers agreed to continue working closely together so North Korea will change its stance and come to the negotiation table to discuss its denuclearization," the defense minister said in a press release. Such an agreement follows recent speculation that the reclusive North may seek to weaken the alliance through its bilateral talks with South Korea. The divided Koreas have held three rounds of government-level talks to discuss North Korea's participation in the Winter Olympic Games in PyeongChang, South Korea. Seoul has said the inter-Korean dialogue is only aimed at discussing North Korean participation in the games, which it says may ensure safety of all other participants in the event. Still, many here, including President Moon Jae-in, hope the resumption of inter-Korean dialogue, the first of its kind in over two years, will also lead to the resumption of multilateral negotiations involving the United States on ending North Korea's nuclear ambition. 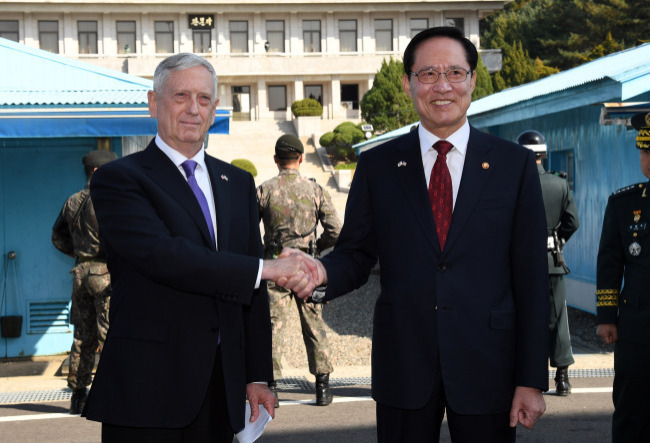 Song and Mattis welcomed the North's participation in the PyeongChang Olympic Games and also vowed their support in making the upcoming Olympics a peaceful and successful event. However, they stressed the need to maintain the building of the countries' defense capabilities. "The two ministers agreed on the need to continue to strengthen the joint capabilities of South Korea and the United States to deter North Korean threats," the ministry said. "In addition, they agreed to continue strengthening their strong, effective and reliable defense readiness to militarily support ongoing diplomatic efforts to denuclearize the Korean Peninsula." Seoul and Washington have agreed to delay their joint military drills in South Korea during the PyeongChang Olympic Games, which will be held from Feb. 9-25 and the PyeongChang Paralympic Games, slated for March 9-18. The allies earlier made it clear that it was only a temporary delay that will not lead to any permanent changes, let alone a suspension of the regular military exercises.